When printing or copying documents in multiple pages, you can halve paper consumption with the duplex printing function. For example, printing a ten-page document in duplex can save 5 pieces of papers compared with single-side printing. The Email/Folder function allows you to distribute your documents as digital data without generating hard copies. Such shared documents are archived in a storage that requires smaller space compared with archiving paper documents. Paperless FAX allows you to view an incoming fax message as digital data without printing it out. If you don't have to have the incoming message printed, simply delete the data after viewing. It also allows you to transmit digitized outgoing fax messages as they are. Don't bother to generate hard copies of outgoing messages just for fax transmission. Recently, commercial printed matters tend to be more diverse in types and smaller in lot size. This trend urges the importance of ability to output whenever and as many copies as required in a short time and strongly calls for needs for minimizing dead stock and paper consumption. In response to such needs of the times, Ricoh offers a range of production printers best for the print-on-demand business. The use of a projector in a meeting helps save time, energy, and papers to print handouts before a meeting. This software assists you in making a smart and effective presentation. Slides are displayed on a Ricoh projector and iPads, and are flipped in real time being synchronized with the action of the presenter. The slides do not have to be printed before the meeting and can be viewed on iPads even after the meeting. So it makes a perfect paperless meeting possible. 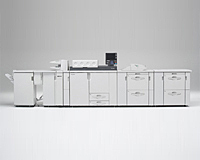 Ricoh's MFPs and laser printers stand by in the energy saving mode when not in use. Set the timer to turn the machine to the energy saving mode automatically when a job is over. We encourage customers to optimize the timer and the mode function to save power .